We’d love your help. Let us know what’s wrong with this preview of The Gambler Wagers Her Baron by Christina McKnight. To ask other readers questions about The Gambler Wagers Her Baron, please sign up. This is a delightful finale story, the fourth in the Craven House series but I believe it can easily be read as a standalone. This Regency romance features the youngest member of the family, Payton Samuels, who was only a child when her mother died. Now she's employed as the governess to two siblings whose mother has tragically died and their father, Lord Ashford, is struggling with grief, depression and guilt over her death more than four years ago. He has cut himself off from the world, going This is a delightful finale story, the fourth in the Craven House series but I believe it can easily be read as a standalone. This Regency romance features the youngest member of the family, Payton Samuels, who was only a child when her mother died. Now she's employed as the governess to two siblings whose mother has tragically died and their father, Lord Ashford, is struggling with grief, depression and guilt over her death more than four years ago. He has cut himself off from the world, going through the motions of living without really connecting with anyone or anything as he struggles with his overwhelming feelings of guilt at this wife's death. Secretly Payton is a usually skilful gambler but this time she loses in a high stakes game and her plans for independence are thwarted by the loss. However, when Lord Ashford (Damon Kinder) recognises her, he secretly pays her debts. As she helps the children she also melts his heart. Can the two find happiness together or will the fickle hand of fate force them apart again? The story is an engaging story with another courageous heroine and a damaged hero in an emotional rollercoaster romance. The characters are well developed and easy to relate to, taking the reader with them as Payton melts the ice around Damon's heart and helps him reconnect with his children and the world. It is an enjoyable conclusion to a fantastic series and I have no hesitation in recommending it to anyone who enjoys Regency romances or is looking to try an excellent example of the genre. The Gambler Wages Her Baron by Christina McKnight is an emotional conclusion to "Craven House series". But can be read as a stand alone. Well crafted with charming and engaging characters. A gentleman of ice meets a lady with a warm heart and gambling issues, in this compelling and emotional story. The storyline is filled with heartbreak, brokenness, struggles, learning to trust, and finding a second chance at love. The children just added to this fabulous story. Payton Samuels and Damon Kind The Gambler Wages Her Baron by Christina McKnight is an emotional conclusion to "Craven House series". But can be read as a stand alone. Well crafted with charming and engaging characters. A gentleman of ice meets a lady with a warm heart and gambling issues, in this compelling and emotional story. The storyline is filled with heartbreak, brokenness, struggles, learning to trust, and finding a second chance at love. The children just added to this fabulous story. Payton Samuels and Damon Kinder, Lord Ashford are a fascinating couple, the chemistry between causes sparks to fly off the pages. Emotional roller coaster but well worth the time to read. Another must read by the talented Christina McKnight! This is quite an intense story , of two people from different social backgrounds , struggling with their brokenness. Payton is the youngest in her family , lost her mother at a young age and her siblings have different fathers , now she’s trying to change her future at the gambling tables. Reading this you see more than ever the heartbreak of loosing family , and realise they don’t have to die to be lost . These two desperately need each other to mend their lives . This is an emotional and also heartwarming book and it’s a great read . An engaging story of hope when all seems lost, Christina McKnight delivers a heartfelt tale. Payton Samuels has been disappointed in life. She lost her mother at a young age and her siblings go their own way. Becoming a governess for Damon, Baron Ashford's two children, she is determined to attend some of his gaming parties and make her fortune. As plans go, it definitely did not work out! Losing terribly she is surprised that Damon bails her out. But she also falls in love with her charges and An engaging story of hope when all seems lost, Christina McKnight delivers a heartfelt tale. Payton Samuels has been disappointed in life. She lost her mother at a young age and her siblings go their own way. Becoming a governess for Damon, Baron Ashford's two children, she is determined to attend some of his gaming parties and make her fortune. As plans go, it definitely did not work out! Losing terribly she is surprised that Damon bails her out. But she also falls in love with her charges and tries to draw them closer to their father. Feeling a broken man after the death of his wife, Damon has tried to keep his feelings tightly bound due to not wanting to care too much and lose again. The Gambler Wagers Her Baron by Christina McKnight is the 4th book in the Craven House series. Since this is the first book of the series that I have read, I can say for certain that it can be read as a stand alone. Payton Samuels gets a position as governess to two precocious young children, basically abandoned by their father. She has the care of the children and must make sure they do not get in his way. Damon Kinder, Lord Ashford is still in mourning for his wife years later. He has practical The Gambler Wagers Her Baron by Christina McKnight is the 4th book in the Craven House series. Since this is the first book of the series that I have read, I can say for certain that it can be read as a stand alone. This is another very good read by Christina McKnight. This author always entertains me with her imaginative and well thought out stories, this one not withstanding. Damon is looking essentially for a nursemaid and companion to his children. Having lost his wife he needs more but is unwilling to admit it. Payton is also looking to make changes in her life. Her immediate love for Damon's children brings a heart rending nature to this read. She is the perfect person to care for these two troubled children. Will this searching and promising attraction between Damon and Payton lead to more? I hate to see the end come to this series but this heart warming book is the perfect ending. I gave this book 4.75 of 5.0 stars for storyline and characterization. We have previously been introduced to our heroine and now we get her story. The sensual nature of this and the other books in this series is mild so I gave it 3 of 5 flames. True to her expressive way of writing colorful characters and thrilling stories, Christina McKnight has another wonderful read set for all. Damon Kinder Baton Ashford, is a lonely, sad, lost man. After losing his wife, Sarah, four years ago he has not found the way to move past his grief. His children flounder and drive governess' away by being unruly. His sister, who mainly raised him, has not love of children is no help either. Payton Samuels lost her mother very young. Being the youngest of fiv True to her expressive way of writing colorful characters and thrilling stories, Christina McKnight has another wonderful read set for all. Payton Samuels lost her mother very young. Being the youngest of five she is forever felling treated like a baby. After hearing her mother's dying words, Payton wants to be the only person she relies on, herself. She is a self taught gambler, knowing how to stack a deck of cards to win, and determined to live on her on with and funds. Taking the position as governess to Damon's children was for the money only and access to his game nights. Finding herself caring for the family and bringing them together was not something she thought about, however, it happened and now she is at a crossroads as to what to do. Damon never bothered with the governess that took care of his children, as long as they were looked after he was good. Then one incident and a defiant reprimand from said governess has his eyes open and his world tipsy turvy. Damon now joins his children in outings and wants to know his governess better but is so afraid of loss that he tries to his it. When Joy, his daughter, has an accident all his world starts to tumble again and it is Payton herself picking up the pieces and bringing things back to some normalcy. Payton finds herself torn between her growing love of the children and their father with the fear she is losing her future independence. Not knowing what to do she heads to what she has known of Home and get oldest sister for advice only to be alone with her sister gone. What to do now? As thing go from up one day to down the next , misunderstandings get blown out of proportion. Can these two hind a way to air their differences or will sorrow and pain hind them again. A cada livro gosto mais da escrita da Christina McKnight. Como disse na resenha do livro 3 da série, a cada livro fica melhor. Este se passa ao mesmo tempo do livro 3 “ A Madame Pega seu Duque”. Sim eu sei... O nome é estranho, não tenho dúvida que poderia ter sido remodelado na tradução, mas os dois primeiros livros já mantinham esse estilo de nome e, quando mudou a tradutora, manteve-se a tradução literal para acompanhar os dois primeiros volumes lançados anteriormente. Chegou a vez de Payton. A A cada livro gosto mais da escrita da Christina McKnight. Chegou a vez de Payton. A única dentre os irmãos que não é filha de um pai nobre. Marce e Garrett são filhos de um marquês, Sam e Jude são filhas de um conde, Payton é a filha de um ferreiro. Ela sempre teve uma queda para o jogo e faz dele um meio para realizar seu sonho e a promessa que fez no dia da morte de sua mãe. Para poder ter uma renda com a qual jogar, ela se candidata a preceptora dos filhos rebeldes do Barão de Ashford que promove regularmente noites de jogos com máscaras em sua casa. Damon Kinder, Lorde Ashford, perdeu sua amada esposa há alguns anos e sofre tanto com essa perda que não quer se aproximar de seus filhos para que não sintam o que está sentindo quando for a hora de ele partir. Só que seus filhos também sofrem a perda da mãe só que duplicada pela falta da presença do pai. Com isso as crianças se tornam travessas demais e nenhuma preceptora consegue permanecer no trabalho, até Payton chegar. Não é hot, podem dizer que é florzinha, mas é emocionante. Crianças, sofrimento, conhecimento, descobertas, perigos, traumas e amor misturados em uma trama envolvente e bem escrita por Christina McNight e o resultado só pode ser bom. Payton Samuels has always known she wants more out of life than being the youngest daughter of the ton's most disreputable family. While her siblings are content to bet their future happiness on marriage. She's got a different plan: she'll work as a governess for Baron Ashford's children, Abram & Joy, but only long enough to win her fortune at one of his infamous masked gaming parties. When she loses, Payton sees her chance at an independent life go up in flames until Lord Ashford surprises Payton Samuels has always known she wants more out of life than being the youngest daughter of the ton's most disreputable family. While her siblings are content to bet their future happiness on marriage. She's got a different plan: she'll work as a governess for Baron Ashford's children, Abram & Joy, but only long enough to win her fortune at one of his infamous masked gaming parties. When she loses, Payton sees her chance at an independent life go up in flames until Lord Ashford surprises her by paying her debts. Since the tragic death of his wife Sarah, Damon Kinder, Lord Ashford, has been a man made of ice & so lost in his grief that he can't even connect with his children. This is the fourth book in the Craven House series but could be read on its own, however the series is so good I’d recommend reading the whole series. The characters are well developed & are so likeable especially the two little terrors Abram & Joy who stole the book. Damon is still grieving Sarah but Payton gradually opens his eyes to the fact that life goes on & it’s possible to love again. Payton is a mature for her age and by caring heals the Kinder family. A lovely read that I read in under a day. I’m so looking forward to Garrett’s story as how he acted with the children was lovely. This is book 4 in the Craven House series, but it can be read as a standalone. However, if you're as fond of historical books like I am, you might want to check out the rest of the series. I will be perfectly honest, I wasn't too sure what to make of Payton and Damon, Lord Ashford, at first. They both seemed a bit out of their depth with Damon's children. However, as the book advanced and they got their footing (especially Payton), it was nice seeing what they could become if only they ga 4 Stars! I will be perfectly honest, I wasn't too sure what to make of Payton and Damon, Lord Ashford, at first. They both seemed a bit out of their depth with Damon's children. However, as the book advanced and they got their footing (especially Payton), it was nice seeing what they could become if only they gave each other a chance. They had amazing chemistry and I just loved them together. Payton wasn't a simpering lady, but she was more than a bit reckless. And Damon, well, he was lonely and lost after his wife died, and Payton helped him get past his grief and see that his children needed him. I did want to knock their heads together a few times, but overall, they were likable. Overall, this was a very entertaining read. It was well-written and the author did a great job transporting me back to the era this book is set in, which is one of the things I appreciate the most when reading a historical romance. Recommendable! By far this was my favourite of the series! Both had lost a loved one Payton knows all about grief, losing her mother at a young age and being the last of her siblings she has had her fair share of heartbreak. She’s not going to wait for marriage to secure her future, after all she’s seen first hand that love only brings heart-ache. Damon Kinder, Lord Ashford has frozen his heart to all feelings he keeps love at bay after his wife’s death. Even though he needs someone to care for his children he By far this was my favourite of the series! Damon Kinder, Lord Ashford has frozen his heart to all feelings he keeps love at bay after his wife’s death. Even though he needs someone to care for his children he can’t bring himself to give them anything but hired affection. But Payton is more than a hired governess the children love her and she’s falling in love with not only the children but the aloof and distant Lord Ashford. Damon can’t help but feel the attraction that seems to flare up every time they cross paths! Loved this amazing story, full of emotional turmoil, the plot has many twists that keep the reader engaged. Loved the dynamics the children brought to the relationship between Payton and Damon. The chemistry between them was just perfect, this was well written and heartwarming story. I recommend the series it’s a splendid well written and worth reading! While this is Payton’s, the youngest daughter, story, one of the things that I love about this particular book is that Christina McKnight is able to show many of the sides of grief over the loss of a family member and how different people in the same family and other families process that grief and how we can all help each other through the difficult time that follows trying to process the loss and how try to move on afterwards. “The Gambler Wagers Her Baron” is very well written, and I literally only put it down to eat, though my intent after I ate was to finish the chapter I was reading at the time and go to sleep because I had been awake 21 hours at that point. Next thing I knew it was 3 1/2 hours later and I’d finished the book. It really is that good. I think this is my favorite in this series! A man of ice just needs a little melting and Payton is just the warm heart that can do. You know when children are involved that its going to be a fun time. I was hooked from the start with her in the closet and couldn't wait to see what she did. The spark between them will leave you breathless and so will the words between them at times. Theirs is an intense story from his heartbreak and protecting her to her gambling and the fight in her. Payton has h I think this is my favorite in this series! A man of ice just needs a little melting and Payton is just the warm heart that can do. You know when children are involved that its going to be a fun time. I was hooked from the start with her in the closet and couldn't wait to see what she did. The spark between them will leave you breathless and so will the words between them at times. Theirs is an intense story from his heartbreak and protecting her to her gambling and the fight in her. Payton has her eyes on a better path, but she just doesn't know the end is so close. She will win you over right away with how she doesn't hold back and loves the children. I loved when she realized that she had found the right path. Damon is a shattered man that thinks he is protecting his kids and himself by being a man of ice. Don't be fooled by him at first because he will melt your heart once you hear his story and get to know him. I loved when he opened his heart again even if he didn't know it. I can only imagine what these children will be like when they are older. Payton Samuels has her life plan. Move out from under the constant loving control of her siblings, and start an independent life. For that she needs work, so she takes a job as a governess. The family she works for have a big problem that maybe she can help with. Her gambling will hopefully help with the funds she will need when it's time to move on. Damon Kinder, Lord Ashford is still suffering from the death of his wife four years earlier. He shuts himself away from everyone, even his children Payton Samuels has her life plan. Move out from under the constant loving control of her siblings, and start an independent life. For that she needs work, so she takes a job as a governess. The family she works for have a big problem that maybe she can help with. Her gambling will hopefully help with the funds she will need when it's time to move on. Damon Kinder, Lord Ashford is still suffering from the death of his wife four years earlier. He shuts himself away from everyone, even his children. The only time he mixes with society is at the card playing evenings he runs at his house. Even then he hides behind a mask. Many authors have told the tale of a lord who falls in love with his children's governess but Christina McKnight uses a little girl to move this story forward. The Baron in this case hasn't been able to get over the death of his wife four years earlier. He has distanced himself from his young children but when the new governess, Payton, manages to win over the children, Damon sees what he has been missing. In addition to being a governess, Payton also gambles on the side in an effort to collect e Many authors have told the tale of a lord who falls in love with his children's governess but Christina McKnight uses a little girl to move this story forward. The Baron in this case hasn't been able to get over the death of his wife four years earlier. He has distanced himself from his young children but when the new governess, Payton, manages to win over the children, Damon sees what he has been missing. In addition to being a governess, Payton also gambles on the side in an effort to collect enough money to support herself. She is strong, independent and smart. The children are bright and funny (although they can be troublemakers at times). In a story where death has cause so much hurt and pain, the characters are able to move beyond the pain to heal each other. 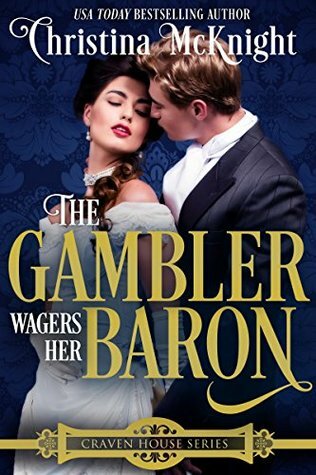 The Gambler Wagers Her Baron by Christina McKnight is a fabulous historical romance. Ms. McKnight has once again delivered a well-written book. The characters are stellar, I love them. Payton goes to work as a governess to earn money for her gambling. Damon has been ignoring his children since his wife died. Payton and Damon's story is filled with drama, humor and spice. This book too me a chapter or two before I really got into the story, but it was well worth it. I enjoyed reading The Gambler The Gambler Wagers Her Baron by Christina McKnight is a fabulous historical romance. Ms. McKnight has once again delivered a well-written book. The characters are stellar, I love them. Payton goes to work as a governess to earn money for her gambling. Damon has been ignoring his children since his wife died. Payton and Damon's story is filled with drama, humor and spice. This book too me a chapter or two before I really got into the story, but it was well worth it. I enjoyed reading The Gambler Wagers Her Baron and look forward to reading more from Christina McKnight. The Gambler Wagers Her Baron is book 4 of the Craven House Series but can be read as a standalone. This is a complete book, not a cliff-hanger. I have been waiting for Payton Samuels to have her chance at a HEA. Hers was an interesting childhood, but one filled with love. Her wanting to prove her abilities and worth to her siblings is based on a partial conversation she o How wonderful! The story is a journey through pain, feelings of guilt and worthiness. Both our hero and heroine are conflicted about what they want, need and deserve. Watching each struggle and come out the other side whole and filled with joy and love was heartwarming. I really liked the story of Payton with the children. Becoming the parent to them that they needed when their father emotionally abandoned them after his wife died. I loved how both he and the children changed during the book. I understand her reasons for gambling yet it almost seemed a slight addiction at times. The only thing I didn't like and drove me nuts reading the book was the constant "in your face" referencing Damon's late wife Sarah and how he loved her and felt responsible for her dea I really liked the story of Payton with the children. Becoming the parent to them that they needed when their father emotionally abandoned them after his wife died. I loved how both he and the children changed during the book. I understand her reasons for gambling yet it almost seemed a slight addiction at times. The only thing I didn't like and drove me nuts reading the book was the constant "in your face" referencing Damon's late wife Sarah and how he loved her and felt responsible for her death. I felt that should have been mentioned less and we still would have known his feelings. I did like the references to the rest of Paytons family and their updates, I just hope at some point we get Garrett's happy ending! Thank you for the ARC, I was glad I got to read this so quickly! This is a sweet, heartwarming and entertaining story. Damon is an emotionally broken man, lost in his own world and indifferent to the rest of life. Payton is a strong, independent and caring woman who is trying to live her life on her own terms. Payton is hired as the governess for Damons two children, thinking that she will work there temporarily then move on to find her dream. But she soon finds herself totally immersed in the family's sad situation, and falling in love with both the children This is a sweet, heartwarming and entertaining story. Damon is an emotionally broken man, lost in his own world and indifferent to the rest of life. Payton is a strong, independent and caring woman who is trying to live her life on her own terms. Payton is hired as the governess for Damons two children, thinking that she will work there temporarily then move on to find her dream. But she soon finds herself totally immersed in the family's sad situation, and falling in love with both the children and their seemingly cold hearted father. It's a beautiful story of love and angst. This book four in the Craven House Series and it is Payton's story. She is a governess to two small children who have lost their mother. Joy and Abram have been let run wild by their father who is still mourning the loss of his wife Sarah. He has shut everyone out until Payton becomes governess of his children. Damon figures out he has been wrong to shut the children out and maybe, just maybe he kinda likes the Gambler. A lovely story of a a father and his children turning their grief and isolation into a family once again through love. The children were adorable even when mischievous and I liked how Payton found herself by assisting them rekindle their bond with their father. Payton's compulsion to gamble to raise money to be self sufficient is an interesting secondary story. An enjoyable story of two different persons that will help each other to see the important things in the life. A man with ice barrier to protect his heart, a governess with love for life and gamble and two child. A book for all that love regency. I received a free book and this is my honest review. Unfortunately, this book was not for me. The storyline is great and the characters lovable. However, the book could not hold my attention. There was too much internal monologue and I got bored. I found myself skipping over a lot of pages trying to find the place where the story continued. I received a copy of this book with no obligations and voluntarily read and reviewed it. Not enough interaction between the H and h for them to suddenly fall in love. Liked the other books in this series. This one not so much.. Most of the book was just the character's thoughts. Boring in parts..